A lot of the dystopian lit coming out these days is in the form of series books, usually trilogies, but sometimes even longer (6 books? Michael Grant? Really?). And it can be FUN to follow a series, but it can also be frustrating to have to wait so long between books. Which ones I am inpatiently waiting for? Beth Revis' ACROSS THE UNIVERSE, an intriguing murder mystery in space, continues Amy and Elder's journey in A MILLION SUNS (add to GoodReads). Razorbill Penguin/Jan 10, 2012. I think I'm hooked on series ... Which sequels are you dying for? 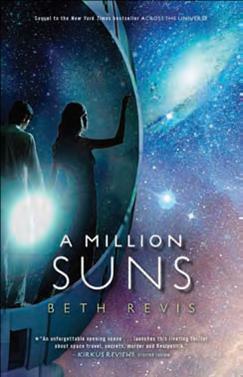 If you answered A MILLION SUNS by Beth Revis, then do I have a treat for you! I have 5 ARCs up for grabs for readers in the US and Canada. For your chance to win, simply fill out this form by Sept 3, 2011 at 11:59 pm CST. I can't wait for A Millions Suns! But also Crossed is on my wishlist, and Ashes and Shatter Me! 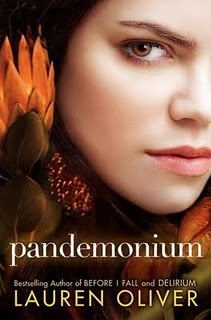 I'm most excited about Pandemonium and Fever! But maybe somewhat more about Pandemonium, because OMG the ending on Delirium! That was insane! 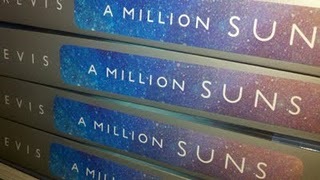 I'm so excited about A Million Suns too! I am most excited about Pandemonium, Insurgent, and Crossed! There are so many good dystopian trilogys out so I think I will be waiting on sequels for a long time! Aah, I want this book SO BADLY. Thanks so much! 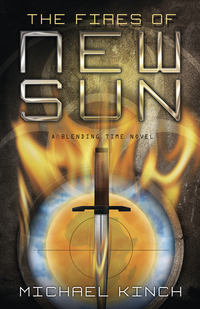 I am *salivating* for A Million Suns, Insurgent, and Pandemonium. Am reading a ton of YA, dystopia, and sci-fi. Am writing a YA sci-fi! I'm very excited about both Pandemonium and Fever and The Drowned Cities. Paolo Bacigalupi is so awesome! I am still on the waiting list at the library for Divergent, for which I'm sort of glad, because I like to rip through as much of a trilogy at one time as I can! Thanks for the giveaway! 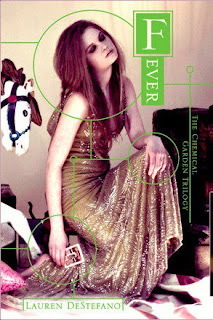 I can't wait to read fever and I hope to read Across the Universe soon!! I've got five of those books you listed on my wish list, and I'm crossing my fingers that I'll be one of the winners of A Million Suns! Across the Universe was one of my favorites this year! Gosh, I don’t even know where to begin my excitement, here. I’m pumped about Insurgent and Pandemonium (LOVE the cover). I also need to read Enclave and Withered but maybe I’ll wait until I can get my hands on the sequels back to back. Thanks for this. Super! I am also really looking forward to Fever and A Million Suns and Pandemonium as well. Lots of great stuff coming out. I just wish it was sooner! I'm looking forward to all of those and especially A Million Suns. Wonderful post. Thank you so much for the giveaway! There are simply too many absolutely fabulous 2012 sequels coming out to choose just one or two or five! I had to start a list on GR just to keep track of all of them! I'm looking forward to SO many of these books! I'm reading Across the Universe right now and LOVING it. I simply must read A Million Suns! I'm really looking forward to Crossed. There are so many, it's hard to choose what to read next! I hadn't heard of Thumped, the companion to Bumped. I'm most excited to read Pandemonium, Fever, and Insurgent. And I really want to see what happens in the sequel to Blood Red Road. Next year is going to be amazing! I'm excited for Thumped and Insurgent, but most of all for Legend to finally come out! Gah - even before I got to the end of your post, 'A Million Suns' was at the top of my must read sequels list, so, fingers crossed! Also looking forward to Bacigalupi's Drowned Cities. 'Across the Universe' and 'Ship Breaker' are two of my favorite #yalit reads this year. I'm super excited about Insurgent! I'm looking forward to SO many sequels: Insurgent, A Million Suns, Pandemonium, Drowned Cities...I'm probably missing some, but those are just off the top of my head! Oh yes A Million Suns!! You KNOW I'm all about the series. I'm totally down with almost every one of these books. Those I'm not it's simply because I haven't started them yet. Give it time and I may be on board with them as well. I write books. MFA from VCFA. My cat owns me. I've been blogging about books since April 2008. Level 2 is now called: The Memory of After! Paperback release in the US!